"What fascinates and inspires me is the process that makes the freshly completed works look weathered as if in decay." For the past seven years, Rainer Gross has been producing an illusory style of monotype. Though composed of several layers of colored pigments, each painting presents a single impression caught in a moment of decomposition. 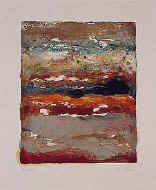 Layers are built up on plates of finely ground color pigments held together with a water-soluble binder. Oil paint is the last layer applied. As the oil seeps slowly downward, it loosens the underlying pigments, which yield a single impression as a sheet of paper is gently applied and then slowly removed. The process itself is very controlled, but the randomness that results from peeling away the paper reveals magical surprises. Rainer has a website at www.rainergross.com/.